It’s almost certain that Donald Trump’s presidency will refuel a “drill, baby, drill” policy on federal lands in the West. The president-elect has also vowed to scuttle the Environmental Protection Agency’s regulations on coal-fired power plants and other rules aimed at curbing global warming. Environmentalists are less certain what to expect from the Trump White House on a simmering backburner attempt to “transfer” federal lands into the hands of the states that want them. Conservative politicians and activists contend that the people who live near the federal lands are best equipped to determine how they should be used. An organization called the American Lands Council is a leader of the transfer movement. The nonprofit American Legislative Exchange Council drafts bills for interested legislators. Several western states, including Colorado’s neighbors to the north and west, have passed legislation to study the transfers. Such a bill passed the Republic-controlled state Senate in Colorado last session, but it died in the Democrat-controlled House. Sloan Shoemaker, executive director of Wilderness Workshop, the Aspen area’s oldest homegrown environmental advocacy group, said the conservation community is “performing triage” on issues as Trump prepares to take the White House. “The most imminent threat is ‘Drill, baby, drill,’ ‘lease before you look,’” Shoemaker said. Trump wants to increase domestic production of fossil fuels. Conservation groups fear lands that deserve protection will be leased for oil and gas exploration without thorough study. The fight such as the one waged over the Thompson Divide area west of Carbondale will become commonplace throughout the West. Meanwhile, there is nothing imminent on the transfer of public lands, Shoemaker noted. “So for us, it’s like a slow-burn crisis,” he said. The problem is, if the transfer gains steam, it might be too late to stop it since the Republican party has a monopoly on the three branches of government, Shoemaker said. The Republican National Committee’s 2016 platform — the outline of party policy on numerous issues — leaves no doubt about the position on public land transfer. “It is absurd to think that all that acreage must remain under the absentee ownership or management of official Washington,” the platform says. “Congress shall immediately pass universal legislation providing for a timely and orderly mechanism requiring the federal government to convey certain federally controlled public lands to states,” the platform reads in part. While the idea once seemed limited to the “radical fringe” of the party, as Shoemaker labeled them, now he wonders if that fringe will steer the party’s direction. State Rep. Diane Mitsch Bush, a Democrat who represents Routt and Eagle counties, voted against bills demanding a state study of a federal lands transfer in 2013 and in 2015. It was approved in the Senate and defeated in the House on straight partisan votes, with Republicans in support and Democrats against. Mitsch Bush isn’t sure what to expect in the 2017 session. “Some of this is reading the tea leaves,” she said. Given the results of the national election, it’s likely a land transfer bill will be introduced again, she said. Proponents will be emboldened with Trump’s surprise victory. The bill for a study of the transfer was introduced last session by state Sen. Randy Baumgardner, who represents northwest Colorado. “I hope that this issue doesn’t come up, frankly, but we’re ready to deal with it if it does,” Mitsch Bush said. Mitsch Bush was appointed Dec. 2 as chairwoman of the House Transportation and Energy Committee and vice chairwoman of the Agriculture, Livestock and Natural Resources Committee. The latter committee would likely have heavy influence on any bill proposing a study of the transfer of public lands to the state. Mitsch Bush opposes a transfer on economic grounds. First, she said, her district depends heavily on public lands for fishing, hunting, skiing, summer recreation and more general tourism pursuits. 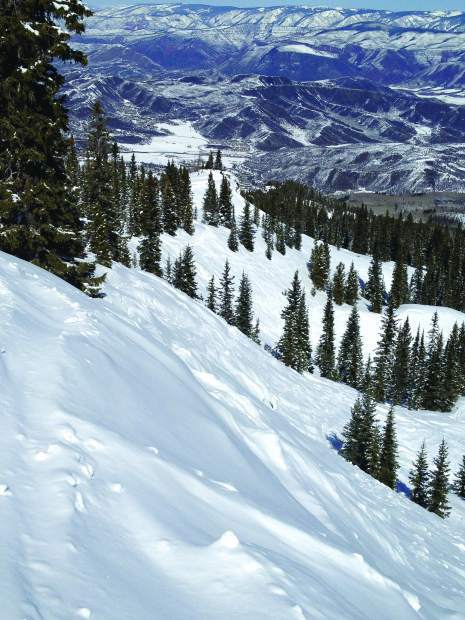 Eagle County has 844,634 acres of public land, or 78.3 percent of the total land area. She sees a tremendous amount of bipartisan support among her district for maintaining public ownership of those lands. “My constituents depend on those lands for their livelihood,” she said. She noted that most of the voices that speak loudest for the transfer in the Colorado Legislature are from districts with little to no public lands. Mitsch Bush is also opposed to a transfer because she doesn’t feel the state could handle the financial burden of managing all those lands. The result, she said, is the state would sell the lands it could and farm out management of the rest to for-profit concessionaires. “You’d have to start charging (fees) like crazy,” she said. Federal agencies manage 24.01 million acres in Colorado, about 36 percent of the total. “Regardless of where you stand ideologically on this, the state of Colorado cannot afford to manage these lands,” she said. With just a little imagination, it’s easy to conjure an image of a company like Outdoor Behemoth LLC gaining control of the Maroon Lake facilities, the immensely popular tourist draw south of Aspen. The company would do what it could to maximize visits. Maybe it would lay more asphalt to accommodate more cars. Perhaps helicopter tours would show off Buckskin and West Maroon Passes while saving tourists the burden of actually hiking them. Outdoor Behemoth LLC could take a novel approach to solving the crowding at Conundrum Hot Springs. Maybe this fictional manager of former national forest lands would simply price most people out of the experience. Imagine, $2,500 for a two-night stay at Conundrum Hot Springs, sponsored by Coca-Cola. A porter could carry the pack for each guest, pitch their tent and cook meals. On the far western side of Pitkin County, lands that aren’t as visually stunning as Maroon Lake would be controlled by Big Industry LLC. Gas companies wouldn’t have to fight for oil and gas leases in the Thompson Divide. They would just have to bust out their wallets. The lands would be sold to the highest bidder. While conservative activists and politicians have pushed for transfers, there’s been a counter effort at the local level in Colorado. High Country News reported in a July 2015 article that seven Colorado counties, including Eagle and Pitkin, have passed resolutions opposing transferring federal public lands to the states. But opponents of transfers might have an ace in the hole. Studies by Utah and Wyoming concluded transfers would be costly for the states, perhaps prohibitively costly. So if public lands aren’t transferred, what’s their fate? Shoemaker said the GOP isn’t a homogenous group when it comes to public lands. Many Republicans support access for fishing, hunting and other outdoor pursuits. That gives at least a glimmer of hope for the public land management agencies. But more realistically, he sees more of the same when it comes to funding for the Forest Service and BLM. Shoemaker said there has been a deliberate effort to underfund the agencies. Then, many of the legislators that vote to limit funding criticize the agencies for poor management. U.S. Rep. Rob Bishop (R-Utah), chairman of the House Natural Resources Committee, has a video posted on the committee’s website where he talks about the need to get federal lands out of federal hands. He was critical of the government’s management of such a vast empire. “It’s too large to succeed,” he said. The effects of underfunding the Forest Service are evident in the Roaring Fork Valley. Shoemaker said the agency’s situation is akin to a homeowner peeling off wood paneling to provide fuel for a fire to heat the house. He suspects that foes of federal land ownership want to make sure the government does such a poor job, it will have to divest itself of the lands. “It’s poorly managed by design, by ideology, through underfunding,” he said. He suspects the ultimate goal for some members of Congress is to sell off federal lands or transfer them to the states.